Black Canyon near Hidden Creek. Since this section doesn't get much use, there is limited beta on flows. In 2013 we ran Black Canyon at 4,500 cfs and at 4,100 cfs on the North Fork gage at Canyon Ranger station. We found a nice, medium flow with fun rapids. While things looked low from the road, there was plenty of coverage, and the rapids had a little push. Bear in mind that the gage is more than 40 Miles downstream, below several major tributaries so expect a lot less water in Black Canyon. Black Canyon is one of my personal favorites. The scenery is outstanding and the water quality is superb. The run starts off in a open valley (see photo) that gradually constricts into a deep, cedar-filled gorge. The bulk of the whitewater on the run can be seen from the road, except for the two most difficult rapids, which are only partially visible. They are both located on the lower end of the canyon. Most of the river is read and run, but big holes may sneak up on you at high flows. The longest rapid ends in a big recirculating hole at the top of a pool next to the road. Look for it while you're scouting during your shuttle. Given the large amounts of wood in play, Black Canyon is not a place for intermediates or beginners. It is class IV paddling at all but very low flows. 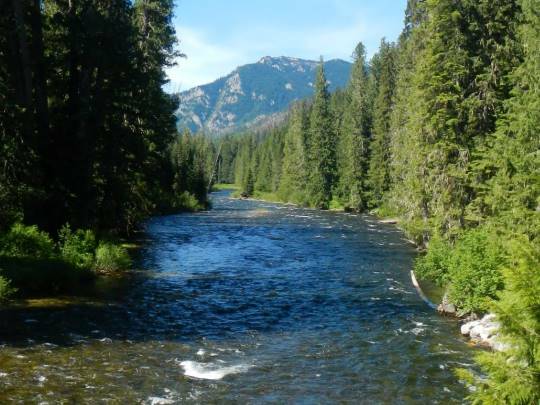 For more good boating in the upper North Fork area, check out Kelly Creek just up the road from Kelly Forks, and Cayuse Creek, a tributary of Kelly Creek (see links in the Planning tools section). Black Canyon can be run all the way from the Cedars (where road 250 meets the river) to the confluence with Kelly Creek at Kelly Forks Ranger Station. The best whitewater is between Elizabeth Creek and the Confluence. Put in and take out where you like, but carefully road scout the entire run for new wood, which can be a VERY serious hazard. There is a good take out located on river left, just up stream of the confluence bridge. It is also a campsite so don't use it of people are camped there. Elizabeth Creek is a popular put in, and there are quite a few other wide turn outs with parking above and below Elizabeth Creek that work as well. There is developed camping at Hidden Creek in Black Canyon (a wonderful place) and at Kelly Forks at the take out. Note that there is also manned ranger station at Kelly Forks. If you're coming from the North, access is from Superior, Montana via Hoodoo Pass on road 250. Exit I-90 at Superior, take the frontage road East on the South side of I-90 and stay on it. Hoodoo usually opens around the first week of July, which generally corresponds with medium flows on Black Canyon. From the South, it is a long trek to Black Canyon via the towns of Orofino and Pierce. It is very easy to do a bicycle shuttle on Black Canyon. Boaters in North Idaho tend to think of the North Fork of the Clearwater drainage a little differently than boaters from Southern and Central Idaho. Our North Fork season starts when Hoodoo Pass opens (from Superior, Montana), which usually isn't until around the first week of July, depending on snow pack. With Hoodoo open, the North Fork and its upper tribs are doable as day trips, as opposed to making the long and arduous drive into the basin from the bottom, via Orofino and Pierce (an additional 250 miles of driving). While peak run off is usually over by the time Hoodoo Pass opens, runs like Black Canyon and Kelly Creek, are still at extremely fun levels. For a weekend trip, it is feasible to tack on the Irish Railroad section, and Skull Creek and Weitas Creeks are usually still at runnable levels then too. The North Fork basin is a welcome extension to our "local" season.